With the exception of a slightly overzealous Janis Joplin-ish track from Angel Blue and the Prophets, all the selections here are solid, with other highlights including a gritty, Johnny Sansone-like “Whiskey House” from Eugene Morgan and the Nightcrawlers, Jill West & Blues Attack’s “Bye, Bye Baby,” a live “Bound to Pay” from the Rich Harper Band that sounds like it could have been taken off one of the Jack Bruce/Robin Trower collaborations, the grainy shuffle of the Nancy McKeen Bluz Machine’s “Slow Burn,” and a soulful and socially conscious closer in “Somebody Gotta Love Them” from Jimbo and the Soupbones. They say the third time is a charm, and volume 3 may indeed be the BSWPA’s best collection yet, so even if you can’t make it to Jergel’s to pick one up or aren’t from the ‘burgh, you’re going to want to get yourself a copy of this fine recording. All but two of the acts (Chris Yakopcic and the Igniters, both of whom had previous engagements) from the CD are slated to perform half hour sets starting at 2 pm Sunday, with proceeds from the album benefiting the BSWPA’s community projects such as Blues in the Schools, the Veterans’ Blues is a Healer tour, the annual Blues Challenge competition, and Blues Goes Pink Divas shows, among others. 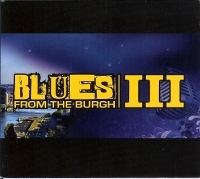 Tickets for the Sunday show are $10 for the public and $8 for BSWPA members, a small price to pay for seven hours of some of the best blues the Burgh has to offer. For more information on Sunday’s event or to order a CD, visit the BSWPA website. This entry was posted in Albums, Shows and tagged Angel Blue and the Prophets, Blues Society of Western Pa., Chris Yakopcic, Eugene Morgan, Izzy and Chris, Jill West & Blues Attack, Jimbo and the Soupbones, Melinda, Nancy McKeen Bluz Machine, Rich Harper, Rumpshakers, the Igniters, Wayne and Wild Root. Bookmark the permalink.